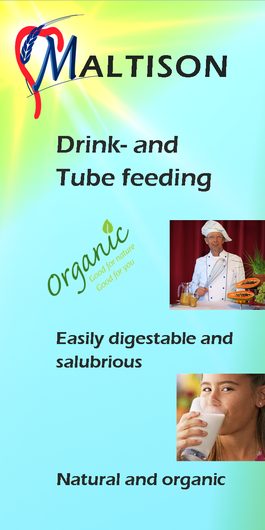 Maltison is the first certified organic tubefeeding worldwide. We manufacture it in the middle of the national park Black Forest in Germany and use its local, pure and vital water. Maltison contains exclusively, high quality organic eatables. We are serious about sustainability, protection of the enviroment and your health. We process Maltison with 100% green electricity, fill it in bottles from recycled glass and pack it in carton boxes of recycled paper. No plastics, no PBA's. We don't have a distributioncentre outside the EU yet but we can send it to your country. Please ask us. People are diverse, have individual needs and tolerances for ingredients. 1 ml = 1 kcal. 1 ml = 1,5 kcal. a special edition just for you and your individual needs and problems. write us and find out about the possibilities! adjusted for children from 1-10 y.o. 1 ml = 1,2 kcal. Unfortunately we don't have English translations yet but we would be happy if someone could help us with that.